Three ideas for your bridal shower brunch menu will help you reach a decision. You can explore an elegant and upscale traditional brunch, a beachy, Sayulita-inspired Mexican menu or a truly decadent Southern-themed affair. A traditional bridal shower brunch doesn't have to be boring. Focus on good food and keep the mimosas flowing for an event guests won't soon forget. Smoked salmon canapes - Lighten up your salmon canapes dish and offer guests a gluten-free option by placing salmon on a cucumber slice instead of bread. Deviled eggs - Deviled eggs are a good option for brunch because they provide healthy protein and can be served cold. Bagels, muffins, and croissants - Serve a traditional cream cheese topping, as well as a creme fraiche or soft-cheese to cover the savory toppings. Go sweet with a variety of jams - raspberry and apricot are crowd-pleasers - and a cream cheese with vanilla, cinnamon and powdered sugar mixed in, or a chocolate spread such as Nutella. Petite fours and mini desserts - Purchase a variety of individual mini cheesecakes, petite fours, and fruit tarts to serve guests. For hosts who want to offer a bit more than the basic menu, consider hiring a chef to create on-the-spot omelets for your bridal shower guests. Chopped peppers, cheese, tomatoes, mushrooms, bacon, sausage, onions and spinach are delicious omelet accoutrements. Fresh herbs can liven up the taste as well - basil, cilantro and thyme are delicious additions to omelets. 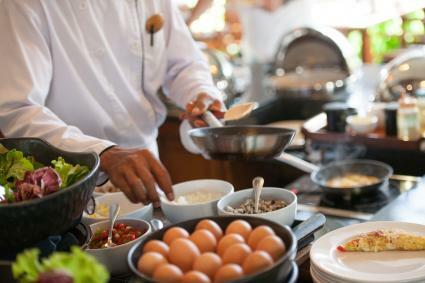 If hiring a chef, keep in mind that many cooks will even buy and bring the ingredients necessary to create the omelets so the host hardly has to lift a finger. 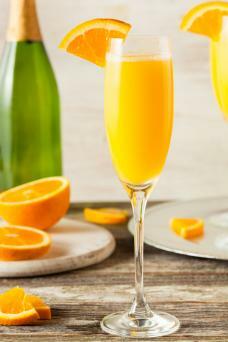 Mimosas are the quintessential brunch cocktail and for good reason. They are light and refreshing, and can be made with varying juices to create fun twists on an old brunch favorite. Keep it simple and low-key by preparing a pitcher or apothecary drink jar filled with mimosas ahead of time, and line up glasses to allow bridal shower guests to self-serve. This enables the host of the shower to enjoy time with the guests and the bride-to-be instead of worrying about filling up glasses all morning. Serve three to four different types of juices, like orange, grapefruit, pineapple, cranberry and strawberry juices. Place juices in labeled glass carafes to up the ante on the décor. Supply multiple fruit garnishes. Berries such as blueberries, raspberries and strawberries work well with the above-mentioned juices. Make sure berries are pre-washed, dried and placed in pretty containers such as little glass bowls or footed glasses in front of the carafes with small spoons or tongs for easy self-serving. Include herb-based garnishes such as mint, basil and lavender. Like the berry garnishes, be sure to pre-wash and cut the herbs into individual serving size portions and set them into a nice serving dish with a small cocktail fork or tongs. Since not all guests may be familiar with each herb, handwriting little labels is a nice touch to help guests feel comfortable choosing their garnishes. Offer guests non-alcoholic beverages as well. Ice water garnished with cucumber, orange or lemon slices and mint is a delicious option. A juice and sparkling water spritzer can be made by combining the two ingredients in a one-to-one ratio (half juice, half sparkling water). Take the menu in a Southern-inspired direction for a bold, unique bridal shower. Ham and cheese brioche knots - What do you get when you mix warm ham, ooey-gooey melted cheese and light and fluffy croissant rolls? A delicious, decadent brunch treat perfect for a Southern-inspired bridal shower. To make, use the Pillsbury ham and cheese roll-ups recipe, but roll them into a knot instead, and place in a muffin cup to bake - et voila! 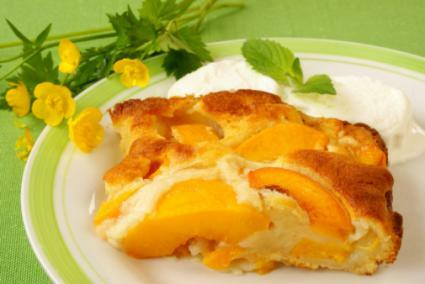 Peach cobbler - Peaches are a real Southern treat. Be sure to swap out the canned peaches for fresh, ripe peaches when making your peach cobbler recipe during peach season. Cinnamon Texas toast bake - Create this delicious brunch-ready dish by using a simple French toast bake recipe. Modify by chopping the bread into little pieces before placing it in the pan to bake and then mix the bread together with the cinnamon and sugar. Add an extra layer of 1/3 cup flour, 1/4 cup sugar and 1 tablespoon cinnamon combined as a crumble topping before popping it into the oven for a truly decadent breakfast treat. A Southern favorite, chicken and waffles is a decadent, delicious pairing and will take your simple menu to the next level. To cut down on the typical mess of chowing down on this dish, serve miniature versions held together with a toothpick. It packs all the flavor punch, yet is dainty enough to eat at a bridal shower. Use your favorite fried chicken recipe but first chop the chicken into bite-size bits before covering in the batter and frying. To downsize the waffles, either cut a full-size waffle along the lines to make mini squares or buy mini waffles to bake. 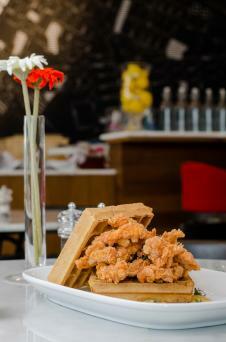 Once both are cooked, simply place the chicken piece on top of the waffle, and the toothpick through them. A little dish with warm maple syrup for dipping is the finishing touch. A bloody Mary punch is a lighter take on the typical breakfast cocktail. Mint juleps are a Southern favorite and are refreshing enough to work well with a heavier Southern brunch menu. For bridal shower guests who may be pregnant or refraining from imbibing, an alcohol-free mint julep or other non-alcoholic fruit cocktails are refreshing alternatives. Don't forgot to include plenty of water - chicken sliders and ham and cheese brioche knots can be on the saltier side and including a flavored sparkling water will help guests stay hydrated. If you prefer making it yourself to buying sparkling water at the store, simply mix one quart of sparkling water with one thickly sliced orange or lemon and allow to infuse for at least thirty minutes before serving. Sayulita, a sleepy little Mexican fishing village-turned-vacation hot spot, has made its mark on Mexican destination maps. Known for a relaxed beachy vibe and artisanal farm-to-table eateries, a bridal shower brunch inspired by Sayulita is perfect for brides who love good food and travel. The trick to nailing this theme is an easy, laid-back feel and top-notch, super fresh ingredients and simple Mexican breakfast dishes. 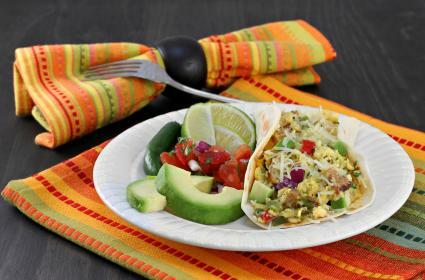 Chorizo and egg breakfast tacos - Chorizo, a spicy Mexican sausage, is delicious in tacos. Make it a protein-packed breakfast dish by adding scrambled eggs, fresh lime juice, avocados, cilantro, and pico de gallo for garnish. Wrap in flour tortillas and place in the oven to keep warm until it's time to serve. Mexican fruit plate with lime and chili - Begin by choosing an assortment of fruit that is common in Mexico - pineapple, watermelon and strawberries are a good combination. Cut and clean the fruit, and arrange on a plate. Squeeze fresh lime juice over the top of the fruit (one or two limes total should do the trick), and very lightly sprinkle Maldon sea salt and chili powder on top. Huevos rancheros sandwich - Huevos rancheros is a classic Mexican recipe for brunch. Traditional huevos rancheros simply consists of beans, avocado, salsa, cheese and a fried egg, but the ingredients can be varied. Turn them on their head by sandwiching all that goodness between two pieces of toast. English muffins, brioche and croissants are all mouthwatering options for the bun. Churros are similar to a Mexican version of French toast - warm bread-like pastry just loaded with cinnamon and sugar. Indulge your bridal shower guests' sweet tooth by offering up a traditional Mexican dessert before they say adios. Full size churros are a bit cumbersome to carry and chow down on at a bridal shower. Since a shower lends itself to guests chatting and moving around during the event, mini bite-size churros create an easy treat for nibbling. All you have to do is follow a standard-size churro recipe and then cut the churro into four equal pieces to miniaturize them. Serve in bowls or on a platter with a small dish of chocolate dipping sauce in the middle. Nothing screams "Mexican vacation" quite like a freshly made margarita. Make three gallons ahead of time so guests can self-serve and you can enjoy the bridal shower with guests instead of in front of a blender. If you want to go all-out, offering two or three types of margaritas will impress your guests. Strawberry and watermelon are two great flavors to consider in addition to the traditional margarita. Agua frescas are a common Mexican beverage that are alcohol-free, light and refreshing. Typically homemade with water, fruit, lime juice and a little sugar, they are simple to make but make a big impact with guests. Try adding some fresh fruit infused water recipes, like Pineapple Mint Chipotle Agua Fresca or a Watermelon Basil Agua Fresca, to pair with the Mexican brunch menu. The goal of choosing a menu theme is to pick one that truly reflects the guest of honor and her interests. While only three different menu options to inspire your planning process are outlined above, the options are truly endless. An East Coast bride-to-be who grew up sailing would adore a clam-bake inspired brunch brimming with fresh seafood options. Likewise, a gourmand may enjoy a farm-to-table style brunch with only the best and freshest seasonal ingredients and someone with a sweet tooth might want a dessert table front and center. By planning your party around the guest of honor, you will turn a standard bridal shower brunch into something truly personal and unforgettable.